Are Fixed Value Points Programs Worth It? Have your hopes for a dream vacation ever been ruined by a lack of airline award availability? Do you have miles in a bunch of different programs but not enough in any particular one to book an award? Do you find yourself confused by complicated airline award charts and routing rules? There is a great way to add simplicity and flexibility to your travel rewards portfolio: fixed value points. There are four major categories of travel rewards programs: transferable points, airline miles, hotel points, and fixed value points. Fixed value points don’t get as much attention in the blogosphere and aren’t as useful for super glamorous redemptions, but they can still serve a very valuable purpose in your overall rewards strategy. These points can be redeemed in a similar manner to cash back, but typically have higher values when redeemed for travel expenses. There are times when booking awards using airline and hotel award programs can be difficult or impossible. Some flights will have no award seats released, or the ones that are released have already been booked. Some programs have “peak” dates when the number of miles or points required for a booking is significantly higher than the standard rates. Certain programs have blackout dates when awards cannot be booked at all. For those with large families who need to book a high number of tickets it may be impossible to get the entire family on one flight even during times of good award availability. Fixed value programs allow you to simply pay for revenue tickets or hotel nights and redeem points to cover the cost. If you only have enough points to cover a portion of the cost, that’s fine, whereas award tickets require you to have enough miles or points to pay for the entire award cost. Many travelers don’t have the time or desire to learn the nuances of airline award charts. There can be so many details to remember: costs, blackout dates, peak dates, routing rules, etc. With fixed value points, you simply search for the ticket you want, and book it like you would if you were paying out of pocket. Some programs work a bit differently than others, but for many you simply redeem the points to wipe the charge off your credit card statement. When you use fixed value points, you are generally paying for the ticket or room first and redeeming points later. Therefore, it is no different from a regular booking from the airline or hotel’s perspective. You will still earn credits toward elite status. This is probably the most overlooked aspect of using fixed value points. Many travel hackers are constantly racking up points and miles to book awards, but never really have a chance to earn elite status because they book so few paid tickets or nights. If the benefits of elite status are something that you value, it may be worthwhile to focus on earning fixed value points to book revenue tickets while simultaneously working your way to the status you desire. Some travelers who collect miles and points try to avoid spending cash on a ticket. But that may be short-sighted. Most people don’t have the ability to earn lots quantities of points and would be better served saving their points for high value redemptions (at least two cents per point). When the travel expense in question could be booked through an award but only at a low point valuation, it may be better to pay out of pocket. If you have a stash of fixed value points you can have the best of both worlds – save your transferable points and airline miles for more valuable redemptions and save your cash at the same time. There are some key differences in how you redeem points and what values you can achieve. We will start with the simplest program and work our way up to the more complicated one. Venture miles are very straightforward. You earn two miles on all purchases and miles are worth one cent each when redeemed for travel, giving you a flat return of 2% on all spending. Venture miles can be redeemed for travel that you paid for with your card in full or in part. You can also use miles to book a future trip, but in this case the charges must be paid in full. With the Arrival card you earn two miles on all purchases and miles are worth one cent each when redeemed for travel. In addition, you also receive a 5% mileage rebate after every redemption. This gives you an all-in return of 2.1%. The one annoying quirk in this program is that the minimum purchase for which miles can be redeemed is $100, requiring 10K miles. You are allowed to make partial redemptions however. Flex Perks is a more complicated program than the other two here. The point values are not such much “fixed-value” as “fixed within a range.” Points are worth a fixed 1.5 cents per dollar when redeemed for hotels, but when redeemed for airfare the values vary according to the official redemption table below from US Bank. As you can see, in order to maximize point values, you want to target your redemptions for tickets near the top end of a bracket. If you can hit the top end exactly, you will get 2 cents per point, though something like 1.7 cents per point will be a more achievable target (near the midpoint of each range). The overall return will depend on how you allocate spending between the different bonus categories. 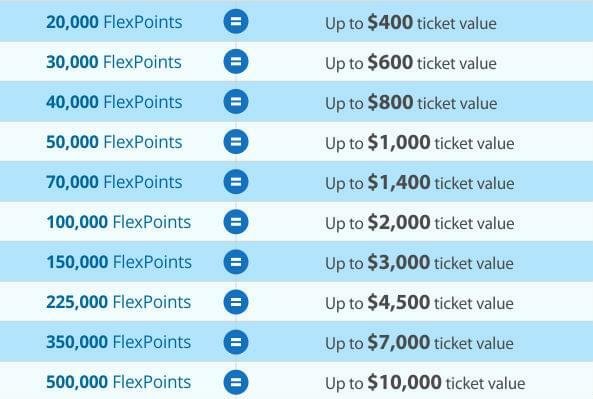 You can get anywhere from 1.5 to 6 cents per point on Flex Perks redemptions.